Willie Nelson, an international icon, is a man of many talents and even more accomplishments. Most prominently known as a singer, Willie Nelson is credited with writing, singing, and producing some of the greatest hits of all time. In addition to being a gifted musician, Nelson is also a fervent champion of marijuana legalization. However, Nelson’s favorite pastime is doting on his horses. Being the wildly successful singer-songwriter he is, it’s no surprise that Nelson’s amassed a sizable fortune. Unlike most wealthy celebrities, Nelson uses his money for good. For instance, he bought 700 acres of land to house 70 horses that were headed for the slaughterhouse. Nelson’s farm is aptly named the “Luck Ranch.” Nelson maintains that his horses are the luckiest in the world. Not only were they rescued at the 11th hour, but they’re pampered as well. Nelson states that each horse is hand-fed twice a day and receive only the best care under his watch. Nelson has long been known for his love of horses. Four years ago, he won the People’s Silver Telly Award for his efforts to cease horse slaughters. 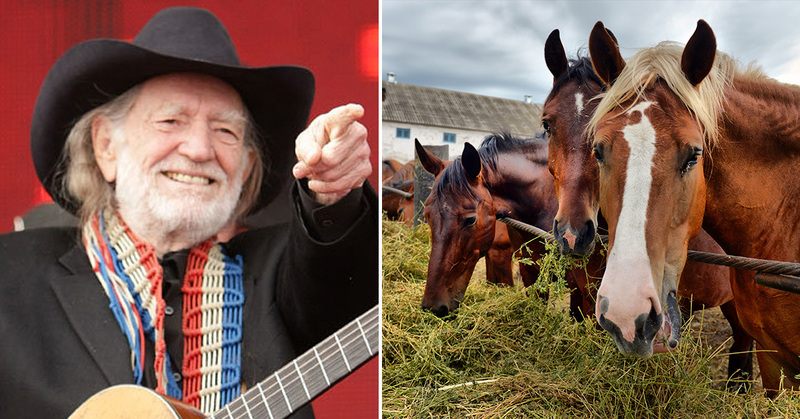 At the ripe age of 86, Willie Nelson has no intentions of slowing down. He will forever be a fond admirer of horses, and he continues to tour to this day. These days, you’ll find Nelson on the road with his bandmates. When he’s not selling out shows, Nelson’s perfecting his weed enterprise, Willie’s Reserve. From marijuana and horses to music and touring, Willie Nelson is a man of many passions. Remember to share this story with your friends!